As you can probably tell from its name, the Christmas Island red crab is a species of crab native to Christmas Island. 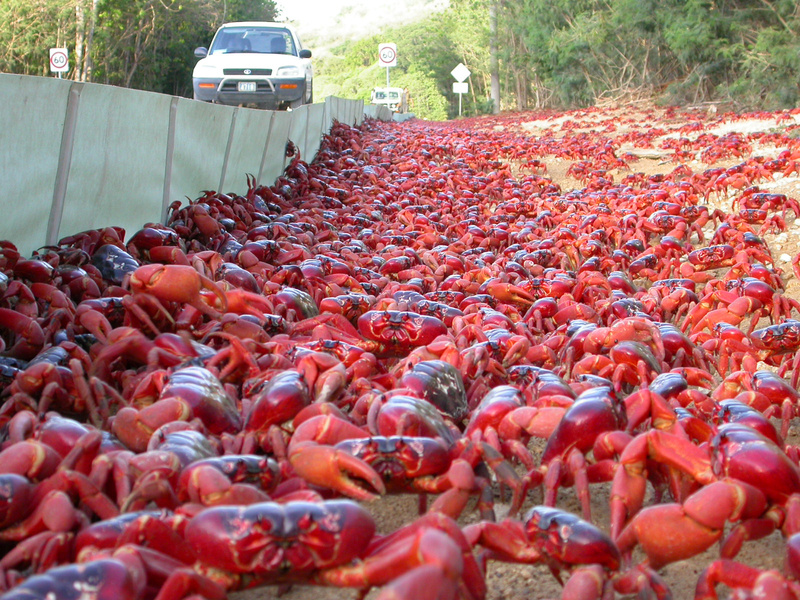 Every year, millions of them will leave their forest burrows and swarm across the island to breed, leaving Christmas Island’s residents to deal with the consequences of their homes being overrun by crabs that outnumber the human populace almost 20,000 to 1. That last part isn’t hyperbole, according to the Australian census reports, Christmas Island has a population of just over 2000 people, whereas according to the most recent, reliable report we could find there are around 40 million crabs living on or around the island, and there used to be more. That figure has taken a hit in recent years due to the introduction of another species to the island, the extremely aggressive yellow crazy ant, which is on the list of “One Hundred of the World’s Most Invasive Alien Species,” put out by the International Union for Conservation of Nature. This ant uses formic acid to kill off a number of the island’s endemic species, in particular, the red crab, with estimates to date being around 10-15 million of the crabs killed by the ants. 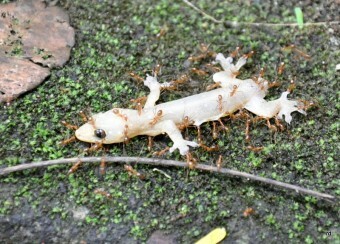 Yellow Crazy Ants carrying a dead Gecko back to their nest. The ant (which was reportedly introduced to the island entirely by accident after it stowed away on a truck around 20 years ago) has decimated the number of red crabs on the island and is so damaging to the environment that few animals can live in an area under ant control. Though this may seem like the locals are caught between a rock and a hard place, the crabs are the preferable alternative here, since they only take over the island for a few weeks and their migration is hugely beneficial to the natural environment of the island. This is because during their journey and while residing in the forest, the crabs turn over soil, spread seeds and generally keep the forest floor clean and tidy as they travel across it. The ants, on the other hand, eat and destroy much of what they come in contact with and, via their feeding habits, have encouraged the growth of various molds and other undesirable fungi. That’s not to say the crabs don’t make a nuisance of themselves sometimes as well, since they’ve been known to puncture tires on parked cars and even walk through people’s homes for no particular reason. But, on the whole, the island’s inhabitants will take the crabs over the ants any day. 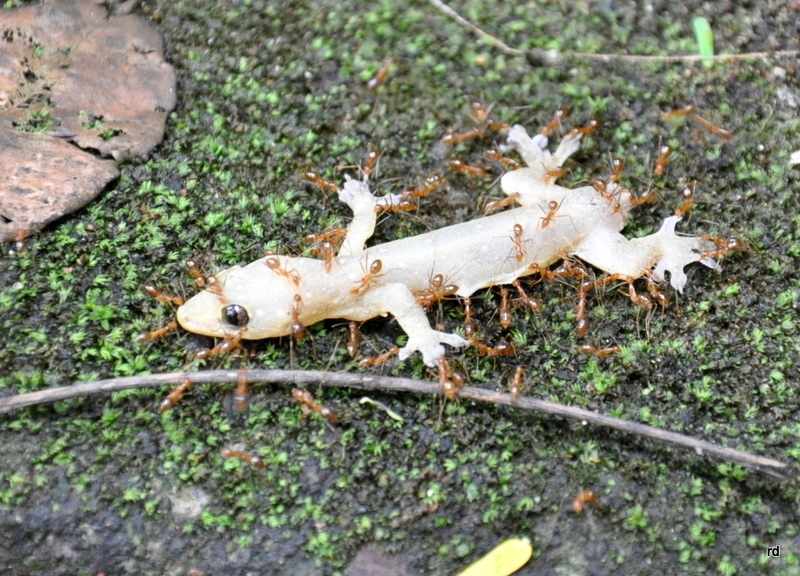 Efforts have been made in recent years to reduce ant population, such as with Fipronil baiting, which was found to reduce ant colony numbers by up to 94%. However, this dip in their numbers was only temporary and the ant populace has slowly been increasing ever since. But we digress. When the local populace isn’t air-dropping poison onto ant super-colonies, they’re preparing for the yearly invasion of red crabs. The migration of the crabs is remarkably sophisticated and it is caused by the start of the wet season, which facilitates the migration by providing adequate moisture for the crabs to survive their (usually) week long journey across the island. The crabs need this moist environment to keep their gills from drying out. Though the start of the migration can theoretically range from any time between late September to early January, the usual migration times fall between October and November. Since the female crabs have to release their eggs at a very specific time, “at the turn of the high tide during the last quarter of the moon“, experts can accurately narrow down when the crabs will being migration to one of 3 days in a given year. Once the males reach the ocean, they make little burrows for themselves and await the females who usually show up a little after. After mating, the males leave and the females hang out for a couple weeks while they lay their eggs. After the eggs have been properly incubated, the eggs are released into the ocean with the high tide at which point the eggs hatch and the little crab larvae spend a few weeks in the ocean surf. Once they are of sufficient size (about 5 mm), the tiny crabs return to the land and begin their long trek to the forest where they will hide out until they reach sexual maturity (about 3-5 years), at which point they too will take part in the mating migration. Humans have only been settled on Christmas Island en masse since 1888. We’ve known about the island since at least 1615, but the island’s rocky coastline proved to be an impassable natural barrier to settlement for several hundred years. However, when noted naturalist, Dr John Murray surmised that the island would contain rich phospate deposits, he urged the British government to annex the island, which they did on June 6, 1888. Later that year, George Clunies-Ross, the owner/king of nearby Keeling islands, sent a bunch of workers to Christmas island to harvest its natural resources; these workers became the first people to officially live on the island. In the past, before the yellow ant began ravaging the island, the main killer of the sexually mature crab during migration was automobiles. Unfortunately, hitting the crabs with your car is an entirely unavoidable every day occurrence during migration season. In response to this, the Australian government closes down certain roads during mating season and has invested considerable resources into special crab paths that go beneath roads. To guide the crabs to them in the first place, thousands of feet of special barriers are temporarily erected near roads that cannot be shut down. On top of that, volunteers work tirelessly to clear roads with rakes, which are used to humanely push the more determined crabs across roads to stop them being squished; some residents even resort to roller-skating everywhere to avoid hitting any during the migration. Despite all these efforts, an estimated half million crabs have been crushed beneath the wheels of cars and trucks. For the curious amongst you, the island is called “Christmas Island” because it was (re)discovered on Christmas day in 1643. In order to keep their burrows adequately moist during dry times of the year, the red crab will shove a bunch of leaves around the entrance of their burrow. How the crazy ant goes about killing the red crab is as follows. As the crabs migrate across the island in extreme numbers, they inevitably disturb an area populated by the crazy ants. Given these ants are extremely aggressive, they don’t take kindly to this and will spray their formic acid as a defence. This not only eventually kills the crabs directly sprayed, often blinding them first, but also can kill other crabs as they walk over areas that have been heavily sprayed with the acid. The ants then are happy to use the red crab as yet another of their food sources. AN EXCELLENT ARTICLE. SO WELL PRESENTED AND PERFECT IN ALL ASPECTS, THE INTERESTING TOPIC, PRESENTATION, THE COVERAGE, LANGUAGE, SNAPS ETC (LEFT NOTHING FOR IMAGINATION….EVEN AT FACTOIDS STAGE, THE INFO BOUT HOW THE ANTS KILL CRBS WAS GRT)….IT WAS LIKE A COMPLETE PACKAGE. TNX KARL.